If you've never been to Australia, you might not be familiar with Vegemite, one of that nation's most revered delicacies. It comes in jars like peanut butter, and is usually eaten spread on toast. It's not especially popular elsewhere, as it is a black, viscous gunk with an extraordinarily vile, salty taste. 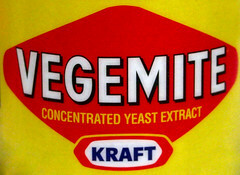 In a curious move that is outraging Aussie expats, the US has banned the importation of Vegemite because it contains the additive folate. Former Geelong man Daniel Fogarty, who now lives in Calgary, Canada, said he was stunned when searched while crossing the US border recently. "The border guard asked us if we were carrying any Vegemite," Mr Fogarty said. Glad to see that the security of our borders is finally becoming a priority.